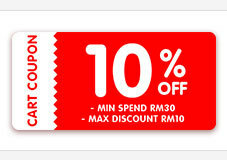 Free shipping over RM 143.90 purchase. 1st experience to buy expensive fashion online, satisfied with the sewing, it looks elegance. Received the orders in less than 2 weeks. Very happy with the purchase as the material is soft and the cutting is great. Highly recommended! Am considering to purchase a few more and hope the seller will include more design in the near future. I order in 18 Jan received on 29 Jan. Delivery time is consider good ~ quality not bad~ thx... Will be buy from here again. Acceptable quality, take long time to arrive. Received the item in good quality. Nice dress. Low quality... colour was so blur compare to advertisment and thus cause the cloth seems 'old'. Not worth buying and really disappointed.The colour advertisme should be only slightly different from the items send but this items is far from expectation. Waited for 1 month. Quality is fine. Hi, I did not receive the item. Kindly check the shipment status for me. Thank you.